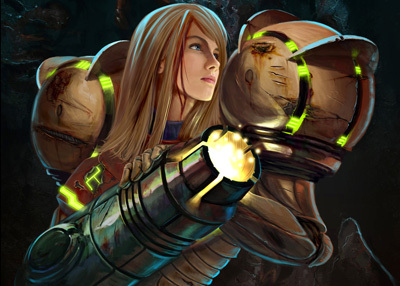 elsabartley .co.uk – a look at technology, gaming culture and the web. For Christmas I received Red Dead Redemption 2 for the PS4, the much anticipated latest game from Rockstar Games, makers of the GTA series. What amazes me is that despite the huge budgets for these games, they still seem to overlook getting the UX foundations right. There is so much time and effort put into these games; the crunch on this game got some press attention at launch, but ultimately no one was surprised. All those hours and all that hard work, crafting a beautiful open world experience that is truly outstanding. However yet again (and this is consistent for Rockstar games) they haven’t addressed a terrible menu system and an even worse control system. I wonder if this issue persists because new game releases are often evolutions of previous games, and like trying to fix the navigation on a website, making the changes after everything has been built on top of it, becomes a prohibitive barrier because it’s too expensive and requires too much rework. But if you spend many years and hundreds of millions of pounds building a game, like a house, get the foundations right! It also doesn’t seem to diminish the game’s success, RDR2 has sold very well. Gamers are all about overcoming challenges, I just prefer my challenges to be by design rather than neglect. To fail to address the control system in a game, feels like filming a movie while neglecting the lighting, or recording an album ignoring the balance, it’s so intrinsic to how the consumer experiences the final product. My complaints about the RDR2 control system stem from a need to perform some kind of finger contortion to use the selection menu. Usually, I’m a fan of radial menus in games, it makes the most of the joystick and is great for quick select. But in RDR2 you hold L1 to open the menu, then just the joystick to select your choice, but there is an added level of complexity where you can use triggers to blindly scroll through the options in each space of the wheel and R1 tabs through different menu wheels. In addition if at any point you release L1 on a selected item is will use/toggle/select, which can often lead to unintended results. Red Dead Redemption 2 wheel menu showing how trigger is used to change the item. Combined with an unforgiving game system, so that if you fire unintentionally in the wrong place, or remove your mask at a critical point, the game will punish you with people shooting at you, higher bounties or even death. This game is often challenging for the wrong reasons and that’s a shame because there’s a lot to enjoy too. My other major complaint with the controls and the menu system is around context. Controls vary depending on what you’re doing, for example, riding your horse, standing next to your horse, walking around, armed or unarmed. Controls changing based on context is pretty standard, but my problem with RDR2 is consistency. The challenge of modern games is their increasing complexity, while the controller remains largely unaltered. So in trying to meet the needs of that complexity buttons have to do more than one thing. But most games reduce this complexity through consistency, so the right trigger will fire weapon, whether on foot or on a horse, firing with a gun or attacking with a fist. But RDR2 then also uses the triggers for navigation, increasing the risk of mistaken action. For a good example of a wheel menu look at Overwatch. Overwatch’s control system is largely very good, one exception is a relatively new character Moira who uses magic in her hands to attack, rather than a gun. The main attack action throughout the game is the right trigger, but with Moira that heals! In addition this animated from her left hand, so there is a visual disconnect. You often see newer players unintentionally healing enemies before attacking. It makes no sense to me that they don’t swap these around so there is continuity between the user action and what they see on screen, and so right trigger is consistent with the main attack as with other characters. Demonstrating the disconnect for Overwatch’s Moira, between the controls and what is shown to the player. Red Dead Redemption 2 is still a beautiful game, although I confess I’d rather go bird watching than on a train heist. With all software development it’s a matter of priorities, but if you can have someone dedicated to animating horse scrotums I’d suggest you can find the capacity to make sure your control system is uo to scratch. 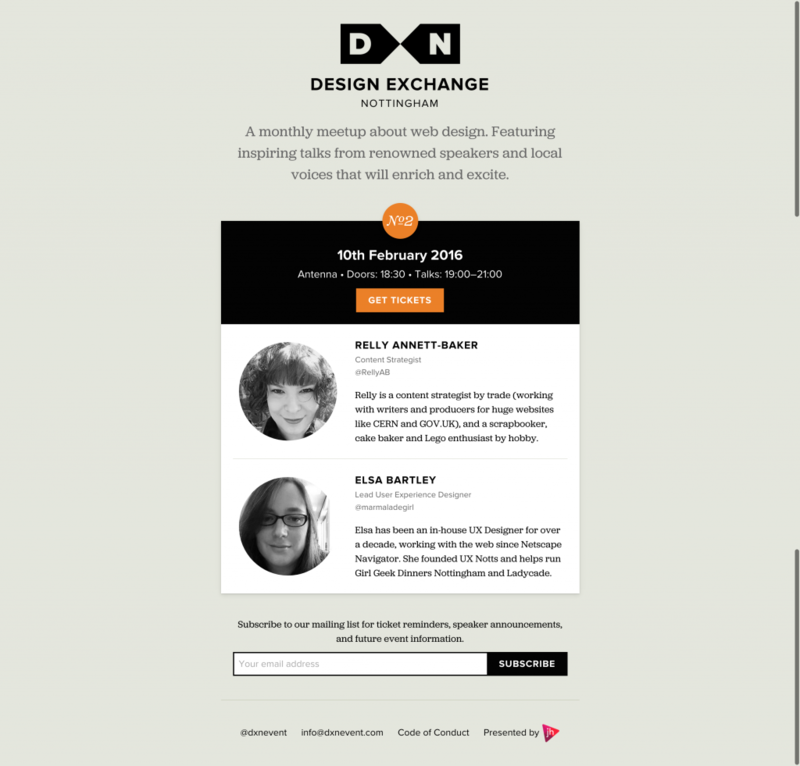 Recently I spoke at Design Exchange Nottingham about playful UX. I’ve had a long standing interest in games as well as professional career in UX and I thought I’d talk about how they inform each other. Plus if all else failed I might get some people interested in some new games. But I thought I’d write up my notes as well since SlideShare wasn’t playing nicely with Keynote. 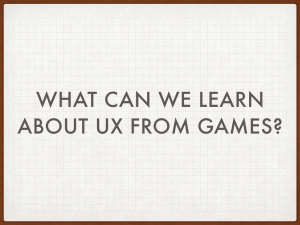 The intention of my talk is to look at what we can learn about UX from games, what they can learn from UX and whether games can make us better designers. 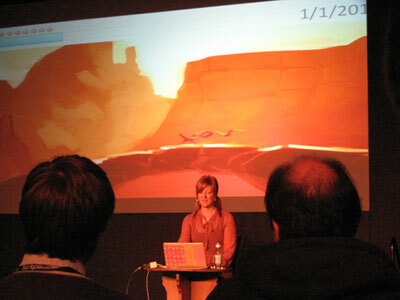 The first game I talked about was Monument Valley. 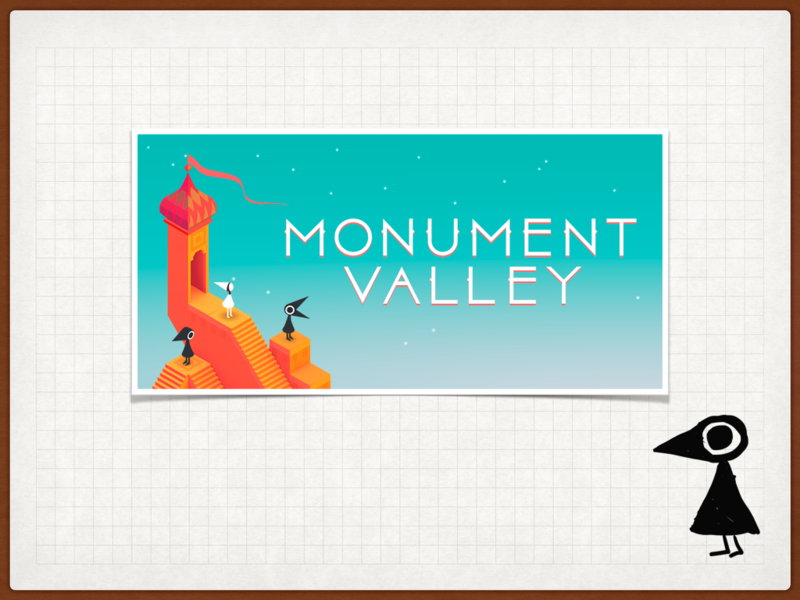 Monument Valley is a great mobile puzzle game that won the best iPad game in 2014. It had about 2.5 million downloads, before it was mentioned on House of Cards. 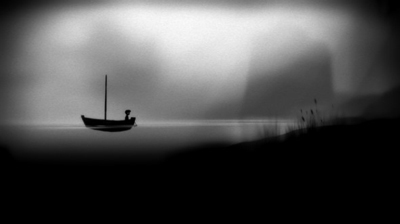 It has a loose narrative and a beautiful clean art style. When we consider architecture in games, we are often talking about level design, whether it is the more traditional Victorian London or a more fantastical setting. 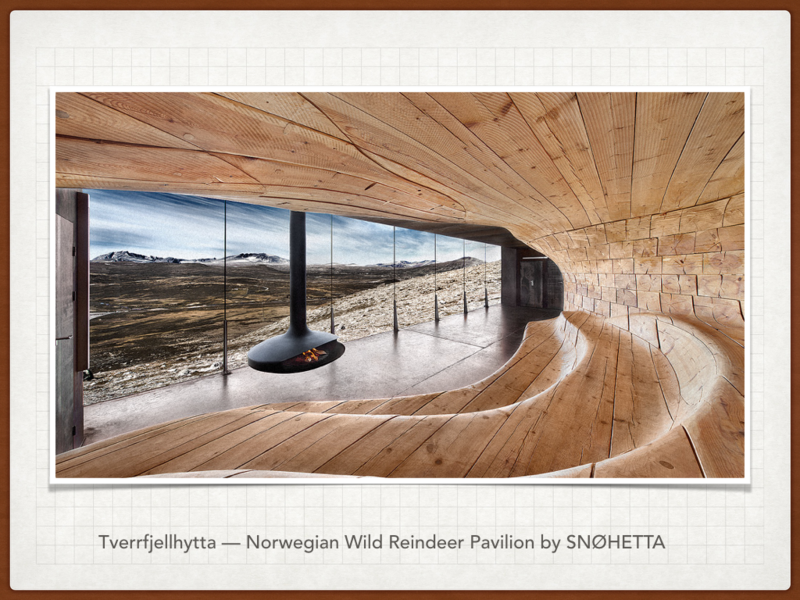 But level design is the physical system setting for gameplay and often a key factor in designing your experience. Frustrated with the lack of local UX events, I’ve decided to run one. 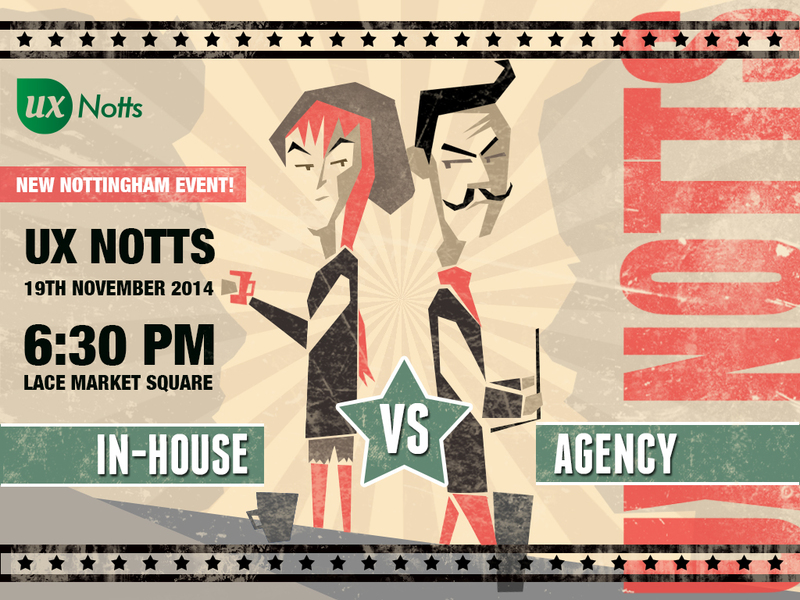 Thanks to support from both the Creative Quarter and my colleague Wayne Moir we have now got a UX event in Nottingham. 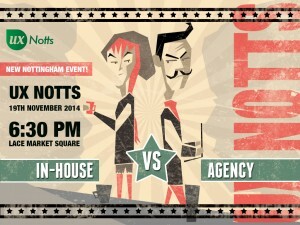 UX Notts has its first event on the 19th November and the Pavilion on Lace Market Square. 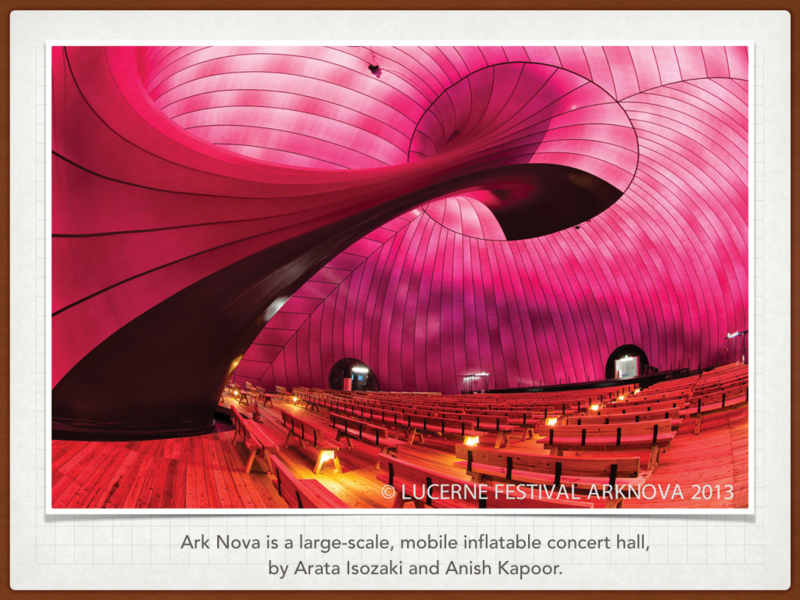 Which will be looking at Agency vs In-house design. Previously I’ve been involved in running events like Nottingham’s Girl Geek Dinners and helped with Women wot Tech in Sheffield, but I’m looking forward to doing something specific to UX and to be back in the centre of Nottingham. I wrote this Twine at about 4am at the end of Gamecity 8. 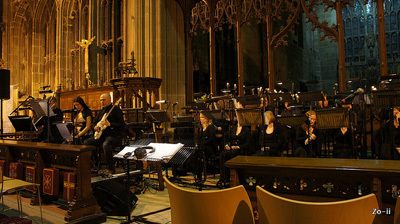 I wanted to at least link to it from here as I haven’t written a blog post about the event. If you are not familiar with the Bechdel Test, it is a simple test to apply to films; (i) there must be at least two women in it, (ii) who talk to each other, (iii) about something besides a man. Many films still fail this test, though it was made popular back in 1985. The test only goes as far to look at the visibility of women in film, and to examine that they are defined by more than their relationship to a man. It doesn’t examine how the women are portrayed and a film that passes the test may in no way be a feminist film. It’s simplicity is both it’s strength and it’s weakness. (i)There must be a female character with whom you can interact, (ii) who doesn’t need rescuing, (iii) and isn’t a prostitute. Such a test comes with the assumption that there are gendered characters within the game. Some games, such as Flow or Space Invaders, do not have any characters of gender. In film, the story is conveyed to a passive audience primarily through the dialogue of the cast. But in gaming, the game is defined by interactions that the player controls. Whether it is shooting, fighting, flying, walking or talking, different games draw on different actions, but it is the the player that performs these actions. For some time I have written about both my professional and social interests on this blog; covering user experience and gaming, but I want to combine them and look at user interface design in games. I think this is an oft-neglected part of games, especially with the usual budget and time constraints, however as with any software design the usability of the user interface can have a profound effect on the user’s experience. Usability in games is not restricted to on screen interactions, there is a such diversity of ways to interact with your gaming platform of choice; be it joypad, keyboard, touch screen, or no controller at all. This makes the platform and method of interaction a key part of the user experience in games, as such I will explore the strengths and weaknesses of these human-computer interfaces. Some games designers and developers think that creating games is completely different to creating other software, because they are creating entertainment rather than tools. However recently as we have seen an increasing overlap between games and applications e.g. Epic Win we can see that these lines are far more blurred than previously considered. Software development has only recently realised the commercial value of user experience, but games developers often consider themselves the audience as well as the creators, failing to realise that their familiarity with their game hampers their ability to see their product impartially; perhaps more frustrated by the focus groups that require them to “dumb down” games than they are in the issues that may cause that confusion in the first place. While games do need to offer challenges in order to evoke a sense of achievement, these challenges should be designed and deliberate and not a hurdle of a poorly designed interface. I was delighted to see that Edge has added to its staff Graham McAllister; the CEO of Vertical Slice, the UK’s first usability testing company to focus solely on games. This recognition of the need for usability in an industry leading publication can only help raise the profile of the value of understanding your users. For the last two weeks, my HTC Desire has been off for repair, and Nokia very kindly sent me an N8 to try for two weeks, so I wasn’t stuck with the terrible handset T-Mobile gave me. The only condition…. this review. So here it is the highs and lows of my first Nokia handset, from a user experience designer’s perspective. I was impressed at first, the N8 offers some haptic feedback, which I think is very valuable when dealing with touchscreen interfaces, but in my opinion it’s too indiscriminate, as you get feedback for any action you perform, including scrolling. However the button feedback is very subtle and effective, with a down and up feedback, much better than other touch screen devices I’ve used. The handset itself ok, about the same size and weight as my HTC Desire, complete with audio jack, USB, camera and MicroSD expansion in a sealed unit like an iPhone. In addition it has a HDMI output, which makes more sense when you look at the camera on this handset. The camera is pretty outstanding, it’s 12 megapixels and has a Carl Zeiss lense and includes a flash. The handset has a dedicated photo button, making it very easy to switch into camera mode. Although the case doesn’t offer a way to protect the lense cover, which is a shame, but would add bulk. The camera is so good that if that features heavily into your phone choice you should definitely consider this handset. 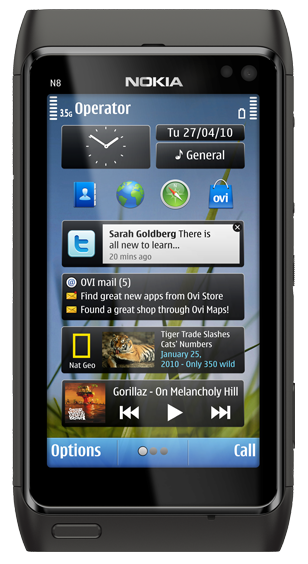 The problem for me came with the operating system, it does do a bunch of cool stuff, but Symbian is still feature rich at the cost of usability. Holding down call, allows you to open apps by voice, but you have to know what to call it, e.g. Internet got me nowhere, while it recognised Contacts and Calendar. The biggest failing for me was the difficulty with which to get to applications. The desktop space, has multiple screens and is easy to customise, but you can only add widgets, not shortcuts to applications; an option called “shortcuts” just offering four pre-populated shortcuts and if these could be customised I couldn’t work out how. Instead accessing the apps requires I press the home button and navigate through a screen that looks like a slightly improved version of the old ‘mystery meat’ Symbian menu, to an application menu, where all the good stuff sits. It’s only saving grace is that it highlights which applications are open with a little green ‘o’ next to the icon in this menu, and that it is easier to close applications than in either IOS or Android. It seems fair at this point to talk about the application ecosystem, Nokia has its own ecosystem called Ovi, in the same way Android has Google and the iPhone has iTunes and Mobile Me. You can buy apps and backup your contacts in the same way you can on any smartphone . The problem here is that with any smartphone the apps have a really important part to play. The usual suspects do make an appearance, so you can still play Angry Birds on your N8, but there will be less applications available for general consumption. The Ovi store works smoothly and is not unlike using Android’s marketplace, so it works well, but doesn’t offer anything new. A shame as I think the app stores are the areas that now really need reconsidering in terms of usability. I did get frustrated when I couldn’t find the handset MAC address, so was unable to add it to my wireless network. Information like this can be well hidden, but it should be available somewhere, after a google I found out you need to put a code into the call screen, which for me is beyond obtuse. The compact charger is a delight, much lighter and smaller than most, although why it isn’t a USB charger I don’t know. Overall I did struggle with this handset a bit, but this may be largely because I’m already heavily invested into the Google ecosystem, so once I sync my phone with my Google account everything else comes to life. But I have no investment in Ovi and despite creating an account for this review, it’s unlikely I would ever use it in the same way – seamlessly across multiple platforms. I think that the hardware is pretty good, the camera especially is outstanding, but it needs an operating system that has been built from the ground up as a smartphone OS and Symbian still fails on that front. Thanks to the great guys at WOMWorld Nokia for the loan of the phone, and credit should be given to Nokia for supporting a venture that engages with social media in a smart way. I expect this will be the first and last review I ever get to do thanks to Twitter, but it has been a great experience.